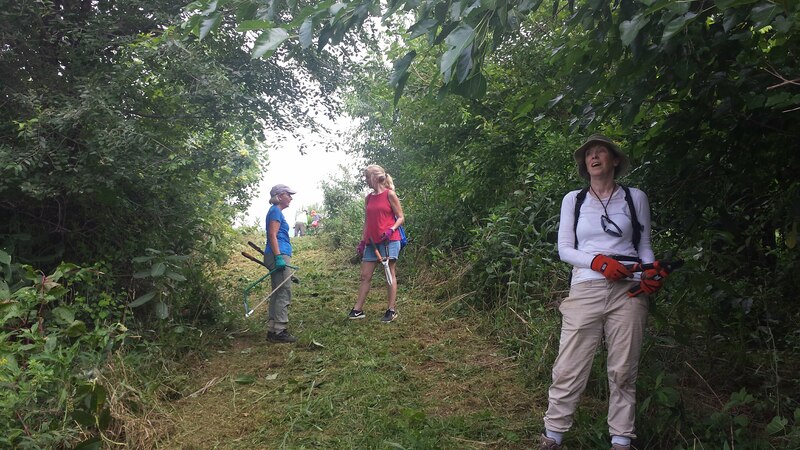 Mow, trim, and extend the Lindy Bain Loop trail near Rowcross Street in Old Trail. We need a bunch of folks for this work, as we try to restore some of the trails in that section of town. Bring your own tools or use ours. Wear sturdy shoes and bring water. Long pants, gloves, and bug spray are recommended. Check our Facebook page for weather postponements one hour before meeting time. When entering Old Trail from Jarman’s Gap Road, continue on Old Trail Drive around all 3 roundabouts (past the Town Center on the left). Turn left on Glen Valley Drive (= the last road before Rt 250). Take a quick right on Claremont Lane and then a left onto RowcrossStreet. Follow around the curve and park on the right side. If coming from Rt 250 on Old Trail Drive, take your first right onto Glen Valley Drive. Take a right on Claremont Lane, and then left onto Rowcross Street. Follow around the curve and park on the right side.